But, sometimes you just have to throw up your hands, pour yourself a glass of eggnog and say “uncle.” And, I think the day before Christmas Eve counts as one of those times. You’ve given it your all, and it’s not like you will never finish Aunt Sally’s hat or Grandpa Joe’s socks. You’ll just finish them in January. No biggie. 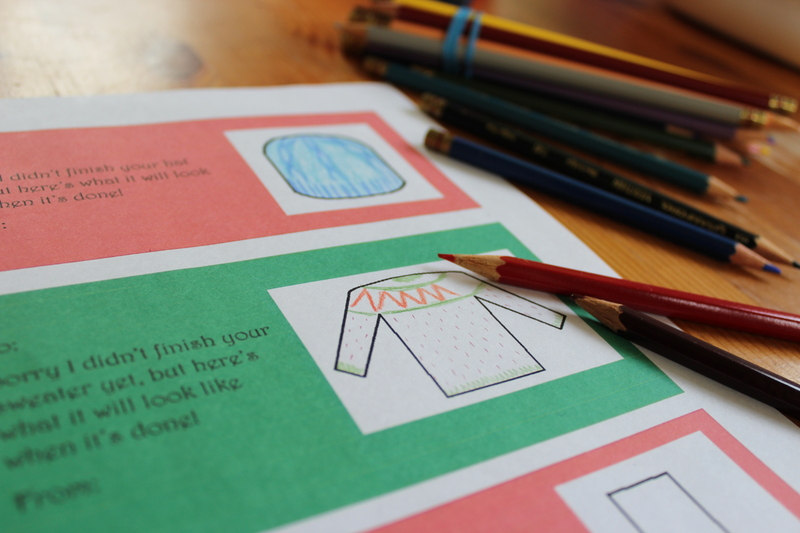 Break out your colored pencils or markers (or glitter glue, I’m not going to limit you), and decorate the tag to show your recipient how amazing their sweater is going to be… when it’s finished. Then get yourself that second cup of eggnog and take a break in front of the tree. You’ve earned it! And, of course, Merry Christmas! This entry was posted in About the Blog and tagged christmas, gift, knitting, tag, UFO, unfinished gift, unfinished object on December 23, 2016 by onemilljellybeans.